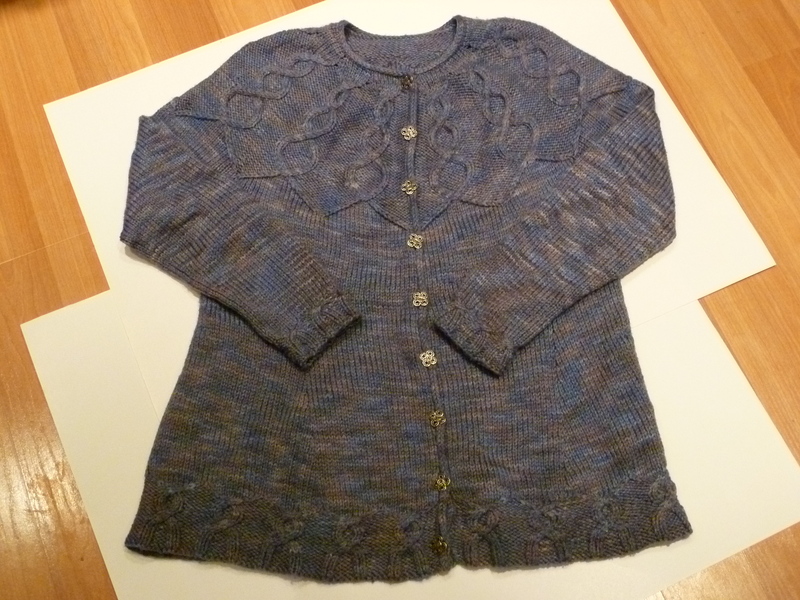 I realized that I’ve never blogged about the Rhinebeck sweater. Hope Ramsay showed off her finished objects from her MDSW purchases (and they *are* gorgeous), so I feel honor-bound to do the same. 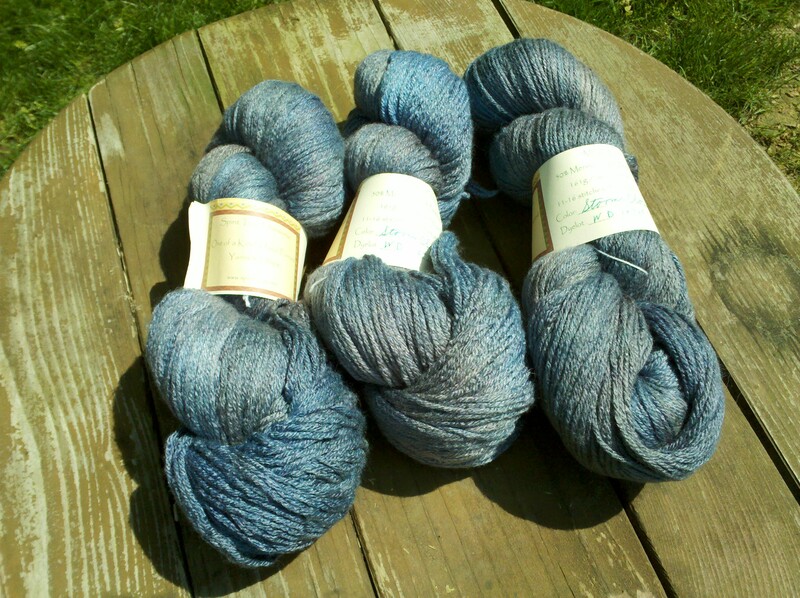 I bought three skeins of Spirit Trail Fiberworks Minerva (50% merino, 50% bombyx silk) which became the Rhinebeck sweater, two skeins of Bugga! sock yarn that I haven’t used yet, and one skein of Miss Babs Northumbria BFL sock yarn that I’ll blog about later. So… what about the Rhinebeck sweater? Well, in August, Carla Kempert found a bus trip to Rhinebeck. And when the stars aligned and I was able to join her… well, a self-respecting knitter can’t go to Rhinebeck in a store-bought sweater, now, can she? So in September, I cast on for a sweater from the Spirit Trail Fiberworks Minerva. To make it more challenging, I (who had only completed one sweater, not counting the two partially-knit sweaters which don’t fit properly and are waiting to be frogged and restarted) decided that this special yarn needed to be a special sweater. As in, one of my own design. Nothing like a challenge! And I love it. 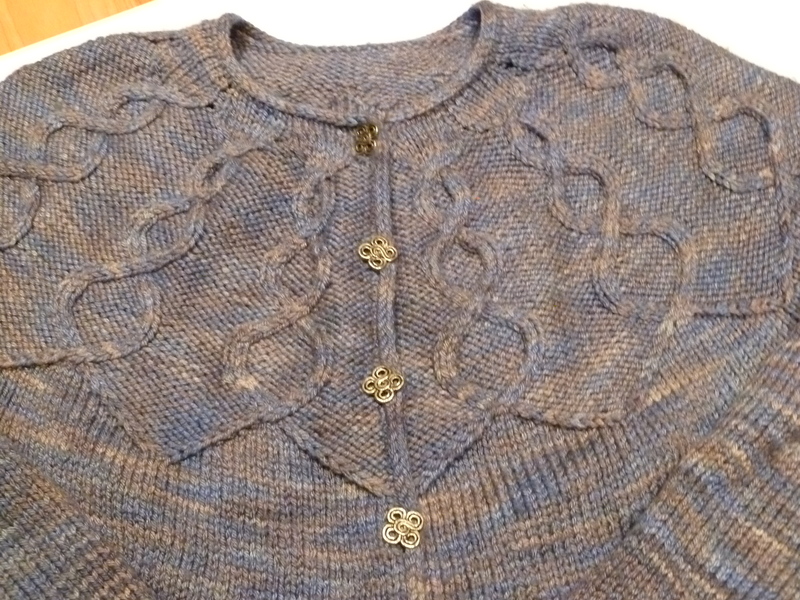 I got a bunch of compliments on it at Rhinebeck (and a couple of requests for the pattern– talk about flattering!). There are some things I’ve learned since that would change the way I’d do things if I were to make it again, but I love this sweater and wear it proudly. I love the yarn, too– it got a little pilly at first, but cleaned up nicely with the sweater shaver. The silk makes it super soft and incredibly warm. I may actually not get as much wear out of it as I planned, simply because it’s so warm, it’s likely to be a winter-only sweater, rather than the three seasons I’d thought it would be. But it’s hard to get too upset about winter weather when I have this in my closet! It’s fall!! I really can’t put too many exclamation points on that one. I love fall. It is my favorite season. For one thing, my husband and I are both October babies. For another, I always associate fall with the start of a new school year, and I am geeky enough to admit I enjoyed school. Fall also means the start of the football season. I wasn’t a big football fan in high school, but at that point in my life, football was synonymous with marching band, and I loved being in our school’s marching band. As an adult, I enjoy watching football on tv (although I still complain during college games when we have to listen to some blathering announcer instead of getting to watch the marching band!). But what I really love is settling in to watch football on tv with a couple of skeins of yarn and some knitting needles in my lap! And of course, the very best part of fall is that it’s finally sweater weather! (Or at least it was, for a couple of days. I wore a pair of hand-knit socks to our county fair this past weekend! But the cooler weather will be back soon.) I’ve got a bunch of projects in various stages. 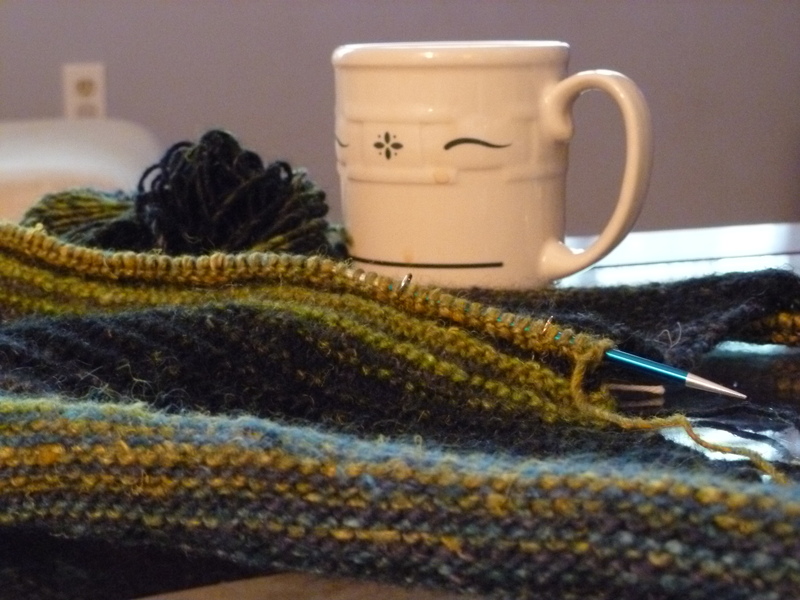 So far, my plans for this fall knitting season are rather ambitious! I am blaming this sweater on my MDSW partners in crime, Hope and Carla. Hope, because she talked me into buying the yarn (admittedly, not a hard sell, as I couldn’t seem to put it down once I’d picked it up! ), and Carla, because she found the bus trip we’re taking to Rhinebeck in October. No self-respecting knitter can go to Rhinebeck in a store-bought sweater! I’ve been knitting madly, but since I’m designing this one myself, there may have been a wrong turn or two (cough, the first version of the yoke, cough), and now I’ve got… urp… 22 days, 17 hours, and 20 minutes to finish it. But who’s counting? Guess I’d better get back to my knitting!